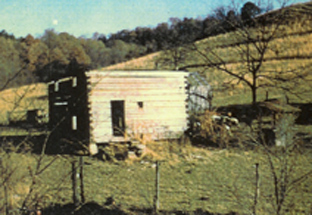 These photos taken in 1955 show the remains of a house built by Jessiah Ferree about 1852 in the area of Burning Springs, Wirt County, Virginia (now West Virginia). Around the time of his marriage in 1852 to Sarah E. Martin, Jessiah left his home in Baltimore, Maryland, and walked over 300 miles to Virginia. There he bought the land near Burning Springs and called it "Standing Stone" because of a large flat stone in the creek on the property. Jessiah walked back to Baltimore and he and his wife, Sarah, loaded a wagon with their possessions and traveled west to settle the land. While building this home, they lived in a cave on the property. 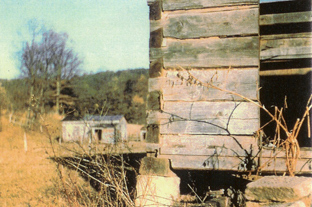 The house was constructed of logs that were hewn roughly square and dovetailed to interlock at the corners. Over the years it was not only occupied by Jessiah and Sarah, but also their children, grandchildren, and great grandchildren. As late as the 1980s portions of the land were still owned by members of the family, however, most of the original timbers had by that time been removed. Jessiah Dubois Ferree, son of James J. Ferree and Catherine Lefevre was born in 1818 and died in 1903. Lineage: James Ferree & Catherine Lefevre/Philip Ferree & Anna Copeland/Philip Ferree & Leah Dubois/ Daniel Ferree & Marie Warenbur.